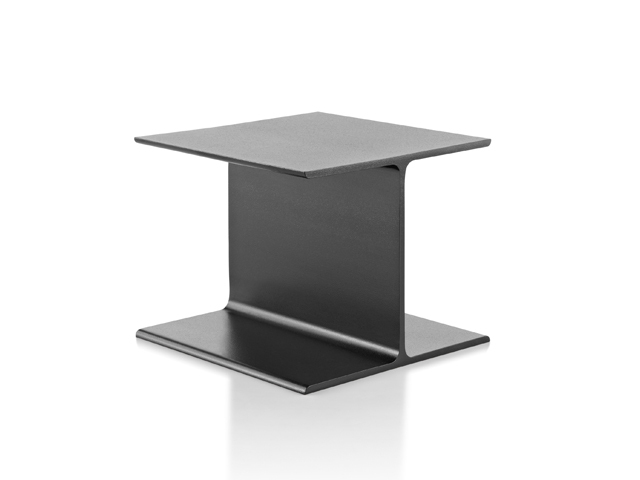 The I Beam side table is a tribute to modern architecture and industrial exactness, providing a versatile side-table or pedestal solution that is ideal for the office or home. Precise angles and a solid demeanour make the I Beam side table perfect for any design-conscious home, office or lounge. Crafted from powder-coated cast aluminium and left bare, the I Beam table offers an auxiliary surface and a witty artistic statement. Inspired by a piece in his own Long Island vacation home, Ward Bennett designed this table as part of his inaugural furniture collection for Brickel in 1963 – long before industrial elements in home furnishings became a trend. In fact, Bennett was a pioneer in using these materials and was honoured by the American Institute of Architects for “transforming industrial hardware into sublime objects”. Textile designer Jack Lenor Larsen said, ''Ward knew how to use materials in an honest way that expressed the structure''. Hale Allen, who commissioned Bennett to design a summer home for him, said he chose Bennett because the designer was “a hard-edged romantic”. Sublime, honest, hard-edged romantic. The I Beam side table exemplifies all those characteristics of this iconic American designer. For normal cleaning, wash coated metal surfaces with a soft cloth soaked in detergent and warm water; rinse thoroughly and dry. Remove scuff marks from low-gloss coatings with pre-softened paste wax, following the manufacturer’s instructions. Remove scuff marks and scratches from high-gloss coatings using automotive polishing compounds, either liquid or paste. After polishing, apply a pre-softened automotive paste wax to restore original sheen. For assistance in determining the appropriate colour and gloss for Herman Miller touch-up paint, contact your Herman Miller Customer Service Representative.